I first heard about this yummy Corn & Potato Chowder from Kelly @ The Well-Read Redhead. It sounded like something the family and I would dig so I decided to whip up a batch. A big thanks to Mama Loves Food for the recipe! I was excited to use my immersion blender again! You get two pictures of that because it's just so exciting. Immersion blender for the win! The color of this, admittedly, is less than appealing. Blending celery will do that. But adding in the heavy cream drastically improved the look and taste. How yummy does this look? It would have looked even better had I saved some of the crispy bacon pieces to garnish it with. Whoops. This is a hearty, stick to your ribs, kind of soup. At first taste I thought it needed a kick so I added some extra seasoned salt and a pinch of cayenne pepper. That did the trick. You can find the original recipe here. Give it a try, I don't think you'll be disappointed. What are you cooking up this fall? Chowder with bacon? Always a win. Immersion blender fun? Woo whoooo! You really can't go wrong with bacon. 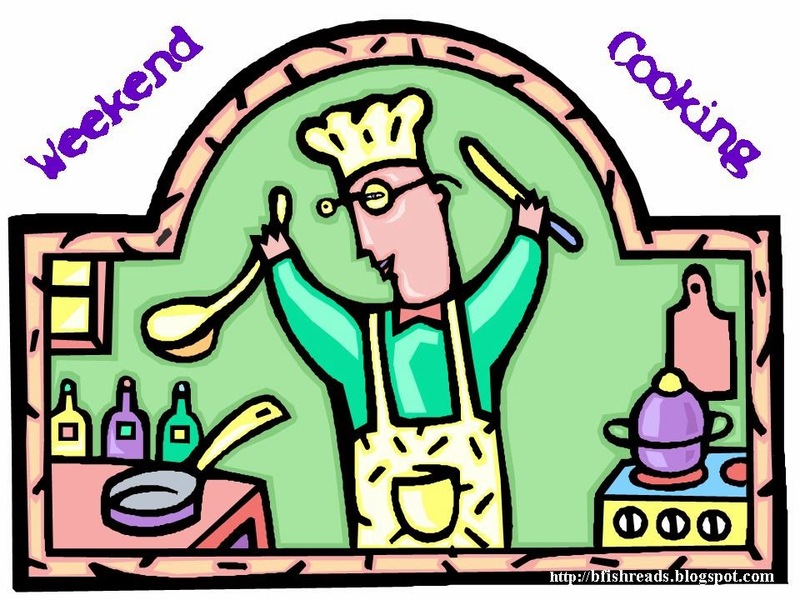 I should make it a mission to include it in every Weekend Cooking post, lol. I'm forever fooling my family into eating things that they THINK they don't like. Go for it! Yum - I love chowders and this one looks delicious! Like the addition of bacon and I also love my immersion blender! Bacon makes everything better ;) The immersion blender is a newer tool to me and I'm loving it! I used my immersion blender on my tomatoes in the slow cooker because they were whole instead of pureed and found out the hard way that the blades need to be totally immersed or you get everything around the crockpot splattered. I love corn and potato chowder but have never pureed it! Love corn chowder -- the bacon adds so much flavor, and all that cream. Thanks for the recipe! You're welcome :D I hope you make this one some time. It's yummy! I love a good chowder in the fall. Yum! Sounds perfect for the cooler weather. You can't beat hot soup on a chilly day. Yum! I'm going to try to make this next week! That looks like a wonderful soup for the season! Thanks :D There's nothing like a warm bowl of soup during this season! It IS! :D Warm and filling and perfect for this time of year. Nom! So glad you loved it! I totes magoats need an immersion blender. I was just standing there going at it with a potato masher for 15 minutes. LOL.